Glen Jacobson was bemused when his family brought him to Northeast Philadelphia Airport instead of a nice restaurant this Father’s Day. Jacobson was about to go for a flight in a plane he’d flown 60 years ago when he was training to become a Navy pilot in World War II. He rode an open cockpit airplane above Philadelphia in one of the tours offered by Biplane Rides Over Philadelphia. The company takes people Philadelphia and the surrounding countryside to give them a taste of the historic aircraft, said Jim Lonergan, the plane’s owner. Made of cloth and wood, the two-seater Steadman biplane was used to train pilots during World War II. After the war ended, most Stearmans were used as crop dusters and stunt planes at air shows; today, they are displayed and collected by aviation enthusiasts. Biplane Rides Over Philadelphia’s Stearman, the Cannibal Queen, was built in 1942 and became a trainer for the Royal Canadian Air Force. Later, she was used as an agricultural spray plane until author Stephen Coonts flew her to each of the 48 continental United States for his book “The Cannibal Queen™.” Lonergan and the rest of the Queen’s 12-person crew purchased her and started giving rides over Philadelphia and New Jersey in 2002. They’ve given 150 rides since but haven’t broken even. Lonergan estimated that operating costs for the Cannibal Queen are $130 an hour, and all of the crew members volunteer their time. The rides, which start at $139 for a 20-minute flight are not profitable but are priced so people can afford them, he said. The crew takes meticulous care of their plane. None of the pilots will fly her with an OK from the plane’s mechanic. And the crew’s regulations are stricter than FAA guidelines, partly because all of the Queen’s pilots are also professional pilots. They won’t fly when it’s foggy or when the wind is more than 15 knots (a little over 17 miles an hour), because that would diminish the flying experience, Lonergan said. And for safety’s sake, passengers must be at least 9 years old. “Safety is really, really important to us, and having a good flight is important to us,” Lonergan said. “That feeling of wind across your face is amazing,” he said. He said flying in an open cockpit is both calming and exhilarating. The Queen’s crew is racing against obsolescence. World War II-era planes are more than 50 years old now, and they’re disappearing – of 8,585 Stearman biplanes built, only 1,000 survive today, according to Biplane Rides over Philadelphia’s Web site. Insurance rates are rising too. But even before the Queen becomes too expensive to keep flight-ready, Plane Rides Over Philadelphia might be legally prevented from taking customers of tours. 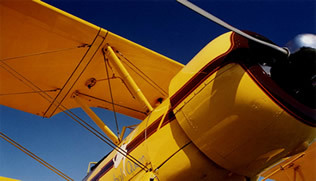 Proposed Federal Aviation Authority rules may prohibit open cockpit airplanes from taking people sightseeing, said Lonergan, who testified in a hearing for sightseeing tour pilots in Washington, D.C., last winter. Flying in a Stearman is something that modern aircraft can’t match, Jacobson said. “You can ride as a passenger in jet plane, but the thrill of being outside with the wind blowing and the sound – the thrill of flying in an enclosed cockpit isn’t the same,” he said.